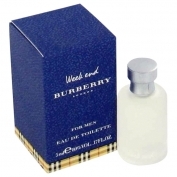 During weekends you can indulge yourself with the comfortable, casual and relaxing character of Burberry Weekend for Men. The composition starts with a real citrusy explosion: bergamot, mandarin orange, lemon, grapefruit, followed by juicy pineapple and melon. Ivy leaves, sandalwood and oak moss are in the heart. The base is surprisingly sweet, made of amber and honey. The perfume was released in 1997. The nose behind this fragrance is Michel Almairac.